On September 3, 1855, the U.S. Army's 600-man Sioux Expedition, commanded by Col. William S. Harney, attacked and destroyed a Lakota village located three miles north on Blue Creek. The fight became known as the Battle of Blue Water, sometimes the Battle of Ash Hollow after the nearby landmark, or the Harney Massacre. The army's attack avenged the Indian annihilation of Lt. John Grattan's command near FortLaramie in 1854. Harney concluded the more than 250 Brules and Oglalas camped on Blue Creek were the guilty parties. He divided his force and led his infantry towards the village. While Harney engaged in a delaying parley with Chief Little Thunder, the mounted troops had circled undetected to the north. The infantry opened fire with its new, long-range rifles and forced the Indians to flee toward the mounted soldiers, who inflicted terrible casualties. Eighty-six Indians were killed, seventy women and children were captured, and their tipis were looted and burned. This first, yet often overlooked, military campaign against the Lakota kept the Overland Trail open, but only postponed until 1863-64 a war between the two nations. 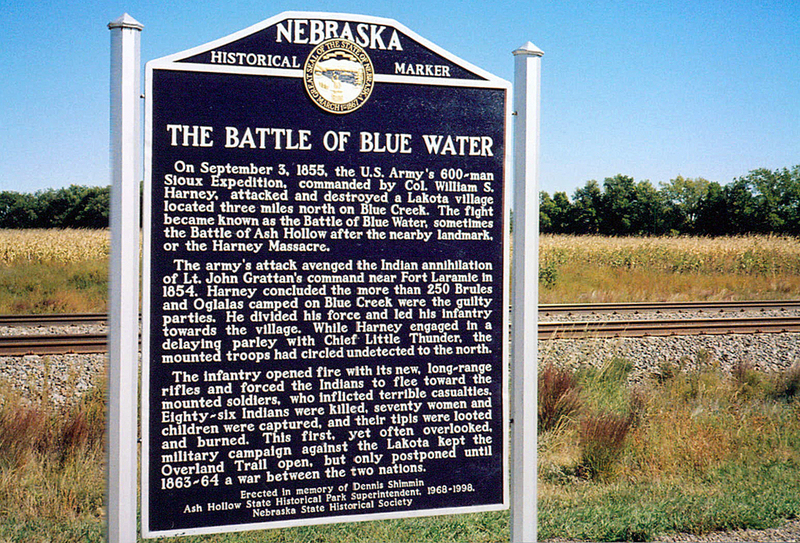 “Battle of Blue Water,” Explore Nebraska History, accessed April 18, 2019, https://mynehistory.com/items/show/236.